This cute San Juan Island guest house is privately located behind the owner's main home. It's well appointed, comfortable, offers water views and access, beautiful gardens, and is in a great location near a community beach. A short flight of stairs leads to the main level where you'll find the kitchen, dining, and living area with TV and wood stove. On this level, there are also 2 bedrooms - the master offers a queen bed and ensuite bath with soaking tub and shower. The second bedroom offers 2 twin beds and there is a bath in the hall with a shower. On a lower entry level, there is a 3rd bedroom with a double bed and a third bath with shower. Water views can be enjoyed from these upper living spaces. . If you have a kayak, you can launch it at the rocky beach accessible via stair steps to the water's edge in the front of the property. Limestone Point Guest House is near Reuben Tarte Memorial Park and only five minutes away from Roche Harbor Resort by car. Guest house located behind main residence. Main residence rarely used. Whole property open to the renters. We also have a buoy in the front of our property. For those bringing a boat with dinghy, you can tie up to the buoy and there is a concrete ramp for the dinghy. Lots of wild life on property and in adjacent waters (seals, eagles, fox, hummingbirds, sea otters, whales, etc.). 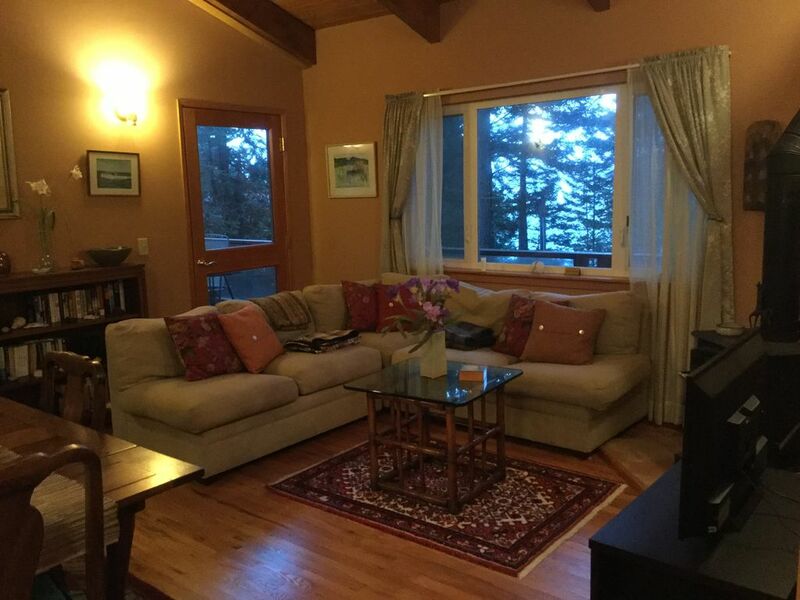 5 minutes from Roche Harbor which has groceries, dining, recreation, whale watching boats, harbor facilities. 2 minutes from park with easy beach access. No pets allowed in guest house but a dog run is available on the property. Internet available. Full kitchen with refrigerator, stove, microwave, dishwasher, wash and dryer. We also provide a crib, high chair and a stroller for the very young. There is a hot tub on the property but it is only available in the peak season. We have been renting the guest house for over ten years with a rental management company but just moved to VRBO. We have many outstanding reviews and return guests. By moving to VRBO we also been able to reduce our rates. Our Peak Season runs from June 15 to Sept 15 each year. The low season from Sept 16 to June 14. Monthly rates, may be available in the winter. The rate will be determined based on length of stay, season and renter requirements. Roche Harbor Resort. They have a lot of activities available. Go to their web site. For example, several dining options, whale watching, kayak rentals, a swimming pool and tennis courts and spa. There is a Golf Course on the island. Owner provides a map and a list of places to visit on the Island. We had a great stay and enjoyed the house. This was a very nice cozy house off the main thoroughfare on San Juan Island. The wood stove was nice to light up at night to take the chill off the air. We spent several nights hanging out and drinking wine down by the water seeing otter and a sea lion. The layout was nice with one bedroom, laundry and bathroom downstairs which worked out nicely as an in-law suite. The twin bedroom, 2nd bath and a master bedroom/bath were on the main level. A short walk past the main house led to the water. If you want to be right in town this house isn't for you. It was about a 20-25 minute drive from Friday Harbor but worth it. The location was wooded, quiet and peaceful and taking a walk or run in the area was very relaxing. Great place for a relaxing vacation. Really nice home. It had everything we needed except a shower in the master bathroom. We enjoyed our stay. Every needed item was there. The house was very clean. The view of the water was terrific. I can't say enough good things about our recent stay at this home. From start to finish it was perfect! Communication was excellent and they provided very helpful information about getting to the island and the home. The home is absolutely beautiful, so many thought details. There is everything you could want or need, robes, toiletries, sandals to wear indoors and to the hot tub, chocolates and the most amazing welcome basket with delicious treats. We had the property all to ourselves for the week and spent many happy hours enjoying the beautiful decks and hot tub overlooking the water. We even saw Orca's from hot tub (magical) as well as otters, eagles, deer and loads of curious seals. We want to thank Le and Bill for their generosity and for sharing their wonderful home with us.. Le was a great host. She was there when we arrived on our first day to orient us to the property and give us some tips about the area, but was back in Seattle for the rest of our trip. The house was stocked with snacks and even a bottle of wine when we arrived. Our kids loved the treehouse, and watching the sunrise from the deck on the water was a great way to start every morning. The house is about 15 minutes from Friday Harbor and 5-10 from Roche Harbor by car. Internet was painfully slow and cell reception (Verizon) was poor, but this a reality of island life and not unique to this house. It may also be a plus depending on what you're looking for. We will definitely try to stay there again when we next make it out to San Juan Island. Perfect cabin for our family vacation! While we were constantly on the go and not at the cabin very much, it was perfect for our stay on the Island. The host is incredibly kind and welcoming, and the cabin was comfortable and outfitted with everything we needed for our stay. Highly recommend! Owner provides a map of the island plus a listing of fun things to do.